Earlier this week, I stumbled across a Fast Company article I had clipped to Evernote last year about the Top 10 Business Rivalries in History. I remember reading it, and the debate it sparked as my husband and I argued which company was the best. I was adamant that Coca-Cola, McDonald’s and Starbucks were clear winners over Pepsi, Burger King and Dunkin’ Donuts. (As for the battle between UPS and FedEx – it was a draw, as both delivered packages to my house akin to a year-round Santa Claus.) Yet, as I reread the article, I couldn’t help but notice that they had left off the most epic of business rivalries – the rivalry between marketing and sales. Why Can’t Marketing & Sales Just Get Along? Despite the fact that both sales and marketing are charged with increasing revenue, how each group gets there and what each are accountable for, are very different. Marketing is responsible for producing an integrated marketing strategy that focuses on priming future opportunities for the sales funnel, allowing sales to focus on the conversion. Sales is responsible for finding and converting right-fit prospects into customers. For sales, the results are black and white – either they produced top-line results, or they didn’t – and sales is always held accountable for their results. Marketing’s success, on the other hand, isn’t as well defined. Since it is more challenging to tie marketing efforts to new client acquisition, it is rare that marketers report on their impact to the bottom line and even rarer they are held accountable for it. This dichotomy has created an adversarial relationship between our two departments. And the data supports this dichotomy. According to the TAS Group, 60-70% of B2B content created by marketing departments is never used, because sales believes it is irrelevant to the buying audience. 79% of marketing leads never convert into sales, which makes sense considering sales reps ignore half of the leads we send them. As well they should! According to MarketingSherpa, only about one quarter of the leads marketing sends to sales are actually qualified. When we combine these statistics with each of our departments’ individual goals and conflicting accountability, the rivalry between sales and marketing seems justified. Justified or not, this rivalry is not efficient. That is why companies are starting to transition from a traditional marketing department and sales department, to one unified department. Called “smarketing” by some, this integrated sales and marketing department is a necessity in today’s hyper-personalized selling environment, where customers demand that companies connect with them personally along each touchpoint in the customer journey, address their needs and concerns, and ultimately, provide a solution to make their lives better. By aligning the sales and marketing department, we can once and for all break down the silos that have kept us from effectively working on the same team. Aligning sales and marketing allows us to replace the competition and isolation with communication and cooperation. It allows marketing to work with sales to develop useful content and collateral that meets the needs of the customer. It fosters an environment that encourages collaboration to develop a strategy highlighting the strengths of everyone involved. It fosters open communication that allows sales to share feedback on lead quality, and for marketing to not only offer qualified leads, but give sales the tools to automate, enable and support their activities right up to the close. Finally, the two revenue-generating departments are working in alignment to increase close and retention rates. Whether we are looking to break down the silos that have been stifling our marketing efforts, or trying to navigate a new “smarketing” department, here are six tips for successfully integrating marketing and sales. There is nothing more powerful in breaking down the marketing/sales silo than persona discovery. They say that people like to talk about themselves, but as a marketer or sales person, talking about our customers is equally gratifying. Working with sales, we as marketers can tap into the knowledge of a sales team who is constantly interacting with the very personas we’re working to document, leading to a shared vision of different subsets of the people we need to reach. Mapping the customer journey extends beyond aligning content. It addresses two of the major points of conflict between sales and marketing: ensuring a smooth hand-off of the prospect from the marketing team to the sales team, and supporting the sales team with the collateral they need. The customer journey takes the disjointed actions of two separate parties and creates a cohesive and clearly defined process that gives our customer exactly what they need at each touchpoint. Generate Insights That Establish Marketing As A Valued Partner. By running thoughtful experiments, we can develop valuable insights into the features, benefits, emotional triggers that evoke action in our target audience. This information is invaluable to sales as they work to refine and evolve their approach in an ever-changing consumer environment. Get a Clear Definition of Qualified Leads. One of sales biggest complaints about marketing is our inability to deliver leads they can close. According to CSO Insights 2014 Sales Performance Optimization Strategy, only 1 in 2 companies say sales and marketing have a formal definition of a qualified lead. This statistic puts into context the stat from MarketingSherpa that about a quarter of the leads that marketing sends to sales are qualified. The fix? If marketing can get a better understanding of what sales defines as a qualified lead, we can focus our efforts on developing content and promoting it on the channels that have the best chance of identify prospects, and nurturing them sufficiently before they are delivered to sales. Move From Marketing Automation to Sales Enablement. Marketing automation, which is one of the most powerful tools that we have at our disposal, is vital to the successful integration of sales and marketing. Acting as a bridge between our two departments, marketing automation provides structure and accountability into the lead management process. This ensures the handoff is a smooth transition. Marketing automation also enhances the sales team’s role before a lead is qualified by allowing sales to start building a meaningful relationship much earlier in the sales cycle. Hold Yourself Accountable For Top Line Contribution. To create an organization focused on accelerated growth and profitability, everyone must understand the role they play in driving top-line growth. The only way to do this is to have a clear understanding of how marketing’s efforts impact overall organizational success. This is where marketing needs to graduate from doers to producers. Rather than measuring the volume of work we do, we need to measure how that work impacts new customer acquisition, demand generation and brand loyalty. By measuring and reporting on the impact of our specific marketing tactics and strategies, everyone is clear on our contribution, and we have goals to work toward in the future. Interesting perspective here, Elizabeth. You’re right in saying that marketing and sales have an unparalleled rivalry. In fact, I’ve noticed such a rivalry between marketing and product too. Despite being a marketer, I’ll say that marketers need to put their hands up and take ownership. P&G and 3M have proved time and again that the best way to sell something is to project it in a way that the customer desires it. Customer data and interactions have led to conclusions which have helped failing products turn around into some of the most profitable ones. So get those marketers out in the field. After all, marketing is all about selling to people not in front of us. Thanks for the comment Vishal! 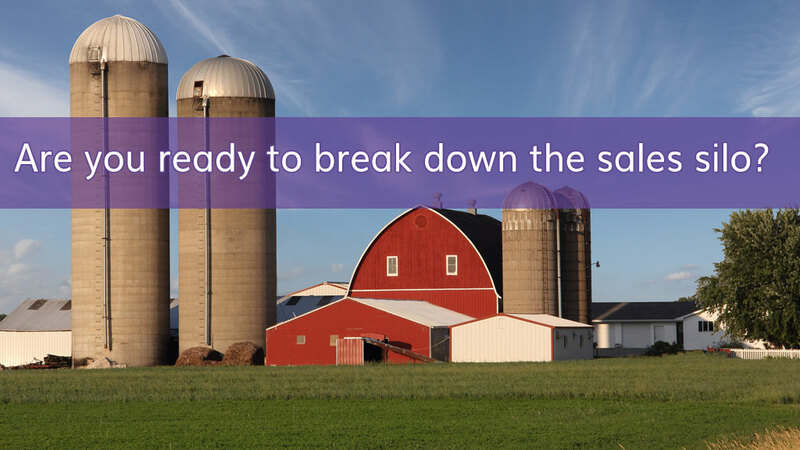 You bring up a great point in that the silo does not just exist between marketing and sales. Unfortunately, the silo can be found throughout the organization, including Product Development, HR and Customer Service (just to name a few). In each of these cases, the customer data and real-time interactions can lead to really get insights that the entire organization could benefit from.